As we do around the holidays every year, we’re running a combination membership drive/charity campaign for the next few days. If you’ve been considering joining up with the Stock Gumshoe Irregulars, our paid membership, now is the time! If you join (or upgrade — such as from monthly to annual membership) anytime between now and December 12, we will donate at least half of your payment to charity. Sign up for the Irregulars by clicking here… or read on for more info on what this means. And if you’re already a member of the Irregulars (sorry, I can’t see your face from here), please accept our sincere thanks and feel free to stop reading now — we’ll be back to our regularly scheduled programming tomorrow. … back when I first began to share the output of the Mighty Thinkolator, before there was even a stockgumshoe.com, readers spontaneously started sending in donations to keep the Thinkolator chugging along … and after the first year of publishing, I felt bad that these people were helping to support the site but they didn’t get anything special in return … other than the warm, fuzzy feeling of a kindness done. So the Irregulars were born — and along with that warm, fuzzy feeling (which I hope remains strong to this day), the Irregulars now get a little extra: more of my blather each week, and sometimes more opinionated blather at that; access to the stock buys and sells I choose for my personal portfolio; and the ability (this is a new feature, we’re still working out the kinks) to post your own guest articles or submit questions or discussion topics. Basically, each week you get an additional piece of commentary — Fridays are reserved for the Irregulars, so most weeks you’ll get the Friday File article, which is usually either an analysis of an investment I find interesting, updated thoughts on one of our favorite stocks, or a teaser solution that hasn’t been shared with the free site subscribers. And then whenever I buy or sell a stock, I’ll post a note in the protected Irregulars-only section of the site — usually with a fairly brief explanation of why I made that choice. I don’t post mutual fund or derivatives transactions like options trades (though of course I disclose them when they relate to stocks I write about), but I do occasionally write about my fund investments and option and warrant trading when I have something I think might be interesting to share. These aren’t the core of my portfolio by any means, just want to be clear. I write much the same way for the Irregulars as I do in this space, but it’s for a smaller group so I’m usually a little bit freer with my opinions, and sometimes I take advantage of the smaller size of the Irregulars membership to write about smaller stocks, particularly when I’m afraid that mentioning those ideas in a larger forum would move the stock price. And as a small bonus, you do get the full Friday articles in your email without having to click through to the site. And no, the Irregulars articles don’t have ads in them. Well, we have a few membership options … so it depends on you. If you join at the Annual ($49) or Lifetime ($200) level, or upgrade to one of those levels, we will contribute half of that payment to charity. If you join at the Monthly ($4.50) or Quarterly ($13) level, we will donate your entire first payment to charity. Heck, you can even join up and cancel right away so you never make another payment, and you’ll at least have forced us to increase our annual donation to the causes we care about — believe me, we’d like nothing better. Well, OK, we’d like it better if you also choose to stay on as a member after your first payment … but it’s fine if you don’t want to, and it’s easy to cancel (just contact us, or cancel yourself through your PayPal or Amazon Payments account if you use one of those payment methods). What are the charities this time around? Well, I run Stock Gumshoe as a benevolent dictatorship, so I get to decide — our local charity is the Food Bank of Western Massachusetts, which is just what it sounds like, and our second charity is Hope for the Warriors, which helps disabled veterans and their families. And yes, I know there are probably charities that you would choose over those, and I hope you’ll do so when you make your own decisions about who most needs or deserves your help this year. And of course, if you’re choosing between your favorite charity and joining the Stock Gumshoe Irregulars, please send the money to your favorite charity — nonprofits and charities around the world are struggling right now, and Stock Gumshoe is in decent shape going into the new year. But if you’ve been thinking about joining the Irregulars, now would be a great time to do so. Thanks for considering! You can sign up for the Irregulars by clicking here. Or if you already have a free account on the site and want to keep your same username and password, just log in and you’ll see a little “upgrade” link next to your name at the top of the page. As soon as your payment goes through, you’ll be a member of the mighty Stock Gumshoe Irregulars, and you’ll receive the thanks of a grateful nation (or at least, the thanks of a grateful me) — and you’ll immediately see a little link that says “Irregulars” in the green bar above (the free members don’t even see the link — that’s how super-cool and exclusive this club is), which is your point of entry to all our past Irregulars commentary and the way you can start a discussion on the site if you so choose. Thanks for your patience as we refuel Stock Gumshoe for the long voyage through 2012 — and don’t worry, we’re happy to sign up new Irregulars any time, but we’re only this pushy about it once a year … tomorrow it’s back to your regularly scheduled teaser unveilings. P.S. If you’re already an Irregular but want to bump up to the next level to be part of our charity campaign (ie, moving from monthly to annual membership), please order your new Irregulars membership here and then contact us and let us know you’re upgrading so we can make sure your old subscription is properly canceled. 20 Comments on "Help Stock Gumshoe, Help a Good Cause"
The Irregular files are great but lets face it, Travis does a great job period. Consider how many of these offerings you did not purchase because he was able to Thinkolater it. Take some of those savings and become an Irregular. We should support him and his very worthy causes. Howard, I agree with you. I’m going to commit, he deserves it. I agree completely…some teasers are well written, and of course our curiosity just gets the best of us. 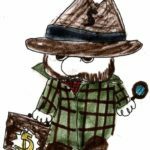 An annual membership to the Gumshoe Irregulars – compared to what you might have spent to find out what the next Miracle Drug/Oil Company/Gold Find – is. Plus – Travis writes with wit and style, an enjoyable read! It is wonderful to know that people like Travis still exist in this world. This is just my honest feeling about him. He has good karma in him and his children and grand children will benefit from his charitable work and kindness. Travis. Keep up the good work. And thank you for donating on our behalf. The cost of irregulars is not to expensive compared to the information you get, but sometimes I don’t get things on Friday ..Travis is a big asset to all of us low on the totem pole investors who can hardly compete with corporate America and Wall St.
Amen to all the above posts!! Let’s keep that Thinkolator working for all of us who are peons of the corporate world since Travis shines the light for all of us to see through all the hype out there. He sure has saved me some pretty pennies for not subscribing to other newsletters. Merry Christmas to you & your family, Travis! And God bless everyone! I used to be Swedish. Not quite, though most of my ancestors came over from Sweden three or four generations ago — I feel a little more Swedish at this time of year. I have no amazone nor paypal but would like to subscribe.Any way to pay with credit card without opening new accounts where I do not want them. I love this guy! …and his almighty Thinkolator! The first thing I do after getting another Motley Fool plug is to see what the Gumshoe has to say about it. Thank you and I’m in. You write well, openly and I think honestly and serve to de-mystify the hype that is promoted by the Gordon Gecko-types who wish to separate us from our money. I’m in for an annual membership. I do not want to use my credit card info over the internet. How do I subscribe to the irregulars? Thanks for your generosity, everyone! We had a record-breaking year for our charitable contributions as a result of this campaign and because of the enthusiasm of fabulous readers like you. It does my heart good to write the checks to our charities and to know that we have a bunch of great new members of the Irregulars, much appreciated. I joined today; the sharing offer my Travis drew me in. My favorite charity is the Salvation Army who help homeless snd down-and-out . They have minimum overhead as most of their staff are volunteers.